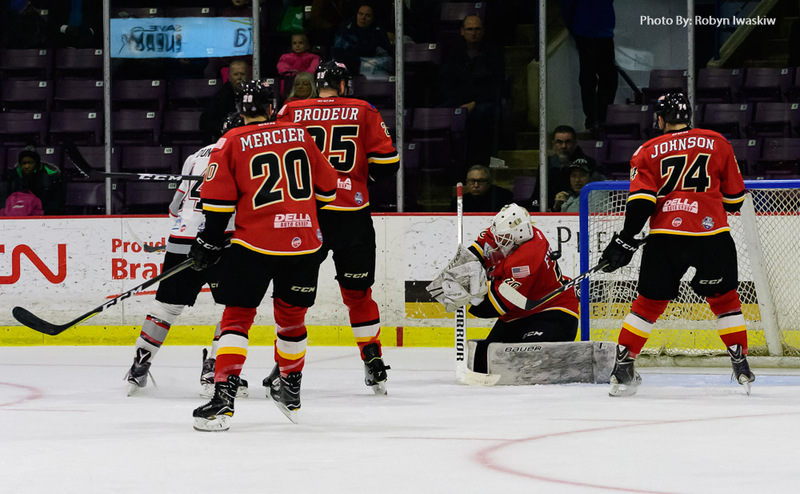 BRAMPTON, ON – The Beast are firmly on a losing streak after losing five straight since their last win December 28th. Their last home win stretches further back to December 17th when they beat a struggling Atlanta team. This week featured a 2-in-2 at home against a longtime foe in Fort Wayne and a divisional rival from Glens Falls. The game started well enough as Willie Corrin got caught tripping only 14 seconds into the game. 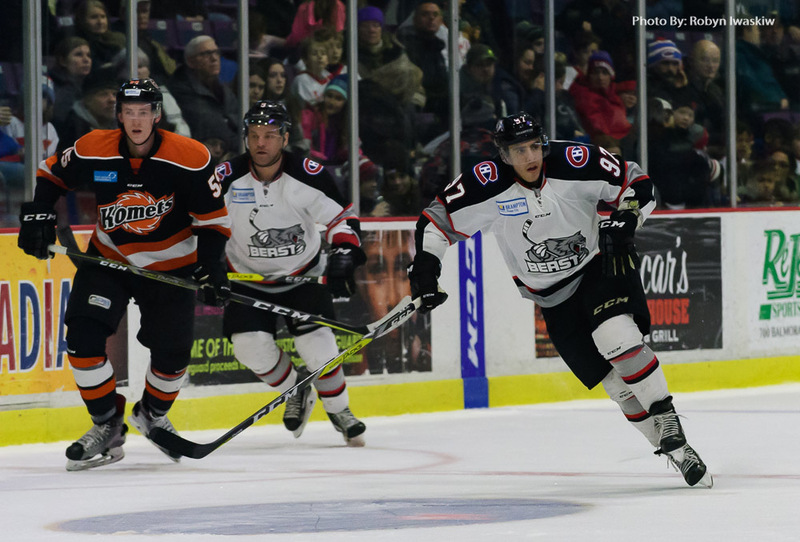 The Beast held off the Komets who got no shots on net during their power play. From there, the Komets took over and got six shots on Andrew D’Agostini before the Beast got their first on Michael Houser. Both goalies were outstanding through the first period, with the exception of a single goal getting past Houser almost nine minutes into the frame. David Ling got the puck from the face-off to start the Beast’s first power play of the game, and passed it back to Jamie Doornbosch on the point. Doornbosch passed to David Vallorani on the other wing, who people assumed would pass, but instead he put it hard on the net to give the Beast the lead. The second period got far more interesting as the Beast scored to make it 2-0, then the Komets got on the board a short time later to make it 2-1. Another short time later, the Beast again scored to make it 3-1, again followed a few minutes later by the Komets to bring it back to a one goal game. Bobby Shea’s goal came with only 44 seconds left in the second period with one second left on a Beast bench penalty for too many men on the ice. That was the only penalty of the period and the Komets capitalized on that error. Matt Petgrave received the Beast’s second tripping penalty almost five minutes into the third period. With two seconds left on that penalty, Jamie Schaafsma found himself alone in front of the net and put it in. The Beast struggled to get shots on net in the third, getting only eight to Fort Wayne’s 19, and they failed to get any further pucks past Houser. With just under five minutes to go, Shea got his second on the night as he put a bullet over D’Agostini’s glove hand to get the game winning goal. 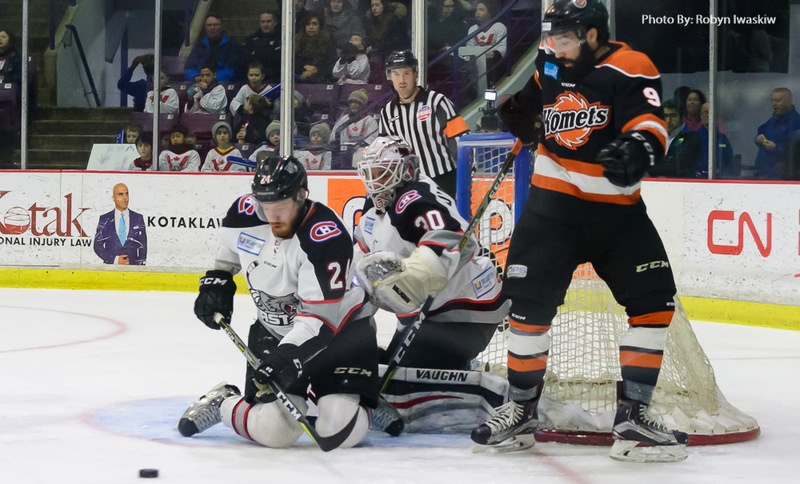 The final goal came with 14 seconds left as Garrett Thompson got the empty net goal from the Komets’ blue line. 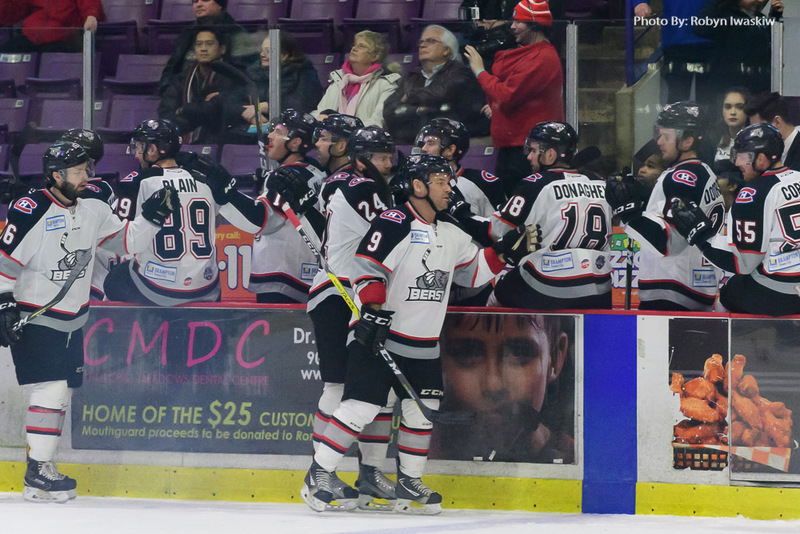 In the end, the Beast were not able to hold their two goal lead and lost their sixth in a row. 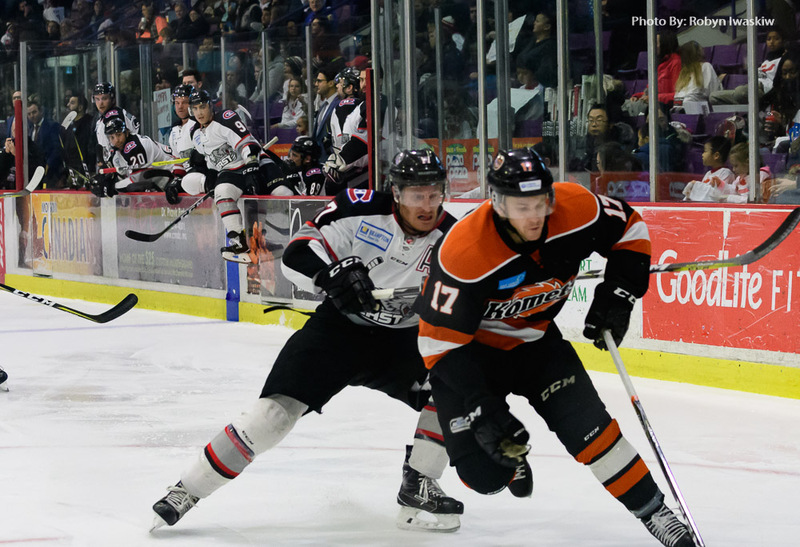 Komets goals scored by Gabriel Desjardins (1), Schaafsma (1), Shea (2) and Thompson (1). Beast goals scored by Chris Leveille (2) and Vallorani (1). After 60 minutes, there were a total of 11 goals and 60 saves shared between D’Agostini and Drew Fielding. That is a lot of hockey action. There were only five penalties for the entire game, with the Beast getting the only penalty kills. The one Thunder penalty was from when Brian Ward retaliated for a Mike Folkes high-sticking, even though he got two minutes too. As a result, the Beast went 0-for-0 on the power play during the afternoon affair. The Beast came into this game on a six game losing streak and having a season record of 1-3-1 against the Thunder this season. Four of those games were determined by a single goal, as did this game. These two teams had just finished playing a home-and-home the weekend before with the Thunder taking both games. The Beast needed to come out strong and get the win. The Beast did not come out strong, but they did come out to play. The Beast opened the scoring in the first period, and by the end of it, the Beast were up 3-2. This was the second game in a row they scored first and had a one goal lead at the end of 20 minutes. Fielding was not the typical goalie that he has been when playing the Beast, and the Beast took advantage of that throughout the night. After the first period, Vincent Dunn had two goals and was within striking distance of a hat-trick. 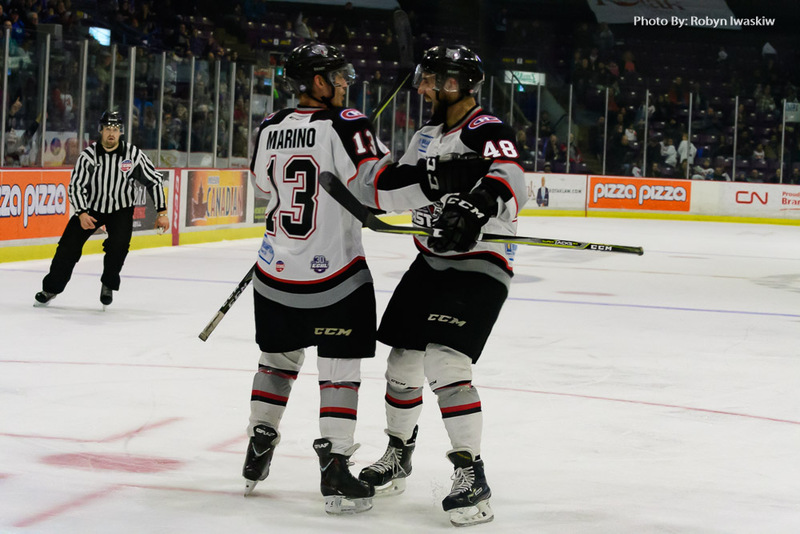 In the second half of the second period, Vallorani scored two goals almost exactly two minutes apart to give the Beast a 5-2 lead and gave himself a chance at a hat-trick as well. The Thunder would make it interesting as they scored late in the second and again early in the third period to make it 5-4. The pressure was on for the Beast to hold the lead as the Thunder were looking like their usual selves again. 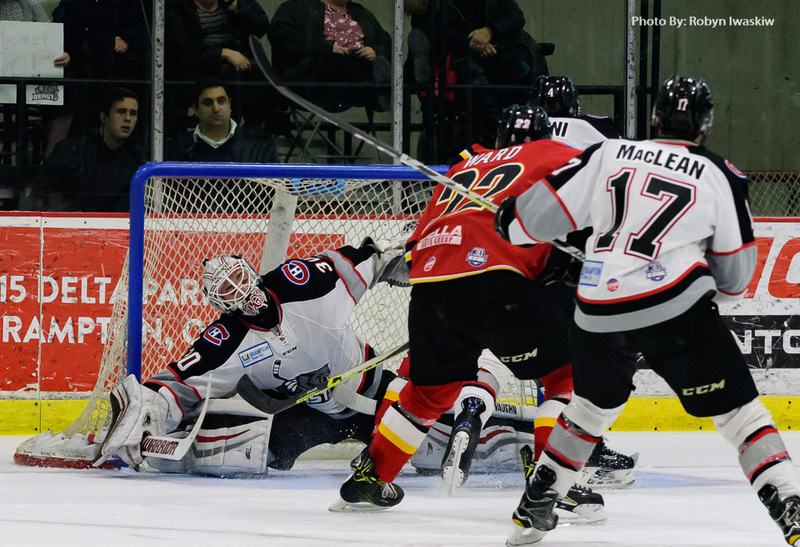 The game winner came only three minutes later when Brandon MacLean redirected a hard shot from Willie Corrin and into the net. The Thunder were not done on the night as Paul Rodrigues squeezed a puck through the smallest space between D’Agostini’s pads, glove and the post. That proved to be the only power play goal of the night as Nathan Todd had been in the box for tripping. With eight and a half minutes to go, it was clearly anyone’s game. 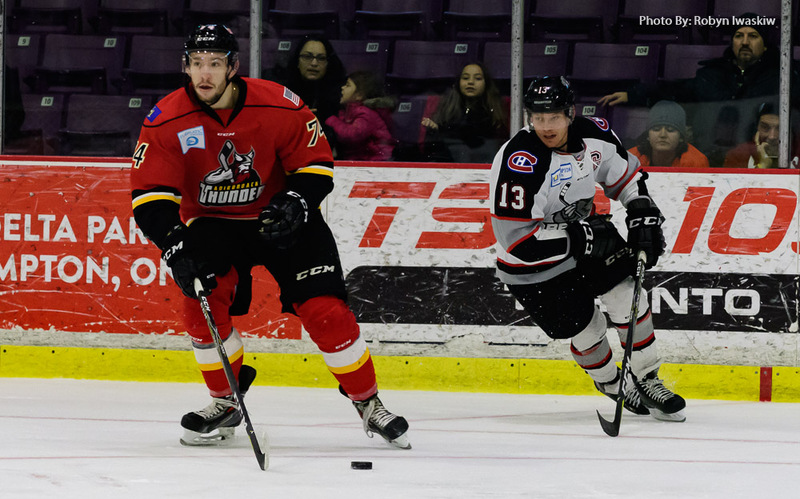 Most of the remaining shots were by the Thunder, but they could not beat D’Agostini for the tying goal. The crowd went nuts when Luc-Olivier Blain was given two minutes for a face-off violation with less than two minutes left in the game. The Thunder got three more shots on net, but could not tie the game. As soon as the game ended, Blain went directly to the linesman to tell him off for the penalty, obviously too late to change anything. In the end, the Beast finally won at home for the first time in a month and broke their six game slide. Dunn’s first period goals were his first with the club since being sent to the Beast by the Ottawa Senators. It is worth noting that in Ling’s first three games back with the club, he has earned a point per game with three assists. As mentioned by many, age is only a number. Also of interest is that both Ciampini and Paul Cianfrini each got three assists on the night. On the Thunder side, both Stephen Johnson and Evan Neugold got their first ECHL goals. Additionally, Mathieu Brodeur, Shane Conacher and James Henry all got two assists each on the night. Thunder goals scored by Johnson (1), Neugold (1), Andrew Radjenovic (1), Rodrigues (1) and Ward (1). Beast goals scored by Dunn (2), Leveille (1), MacLean (1) and Vallorani (2). After another hard weekend, the Beast play their second 3-in-3 in three weeks. This time all three will be away and against other teams from the North. This is a chance to catch up in the standings.